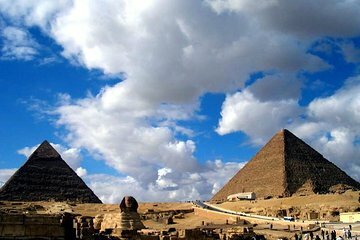 Discover the last remaining wonder of the ancient world on a private tour from Cairo. Visit the Great Pyramids of Giza, the Sphinx, and the Valley Temple over the course of four hours and learn about the history of ancient Egypt from your tour guide. Enjoy panoramic views of the monuments and the Sahara Desert before heading back to your hotel in Cairo.